Albania: Miracles Amidst the Raindrops!. 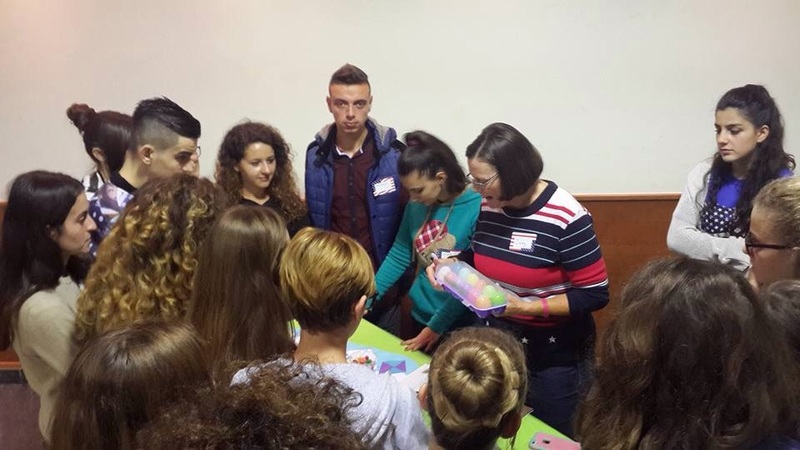 Wednesday in Albania is beautiful, but yesterday as the magazine distribution began on three of the university campuses, some of our team members weren't feeling well and the skies were gray. A downpour ensued; however, in God's goodness, temporary shelter was found, the heavy rain eventually went away, and the remainder of the magazines and test booklets were quickly given to large groups of students who seemed eager to receive them and wanted to have some additional conversations between classes. Our team was excited to be able to spend some time in the afternoon with our friends, Zamir and Anila! It was great to be able to hear how God has been working in their lives since they had moved to Macedonia! That evening we again found ourselves walking in the rain as we left to present our "American Night" for the students. We were blessed with about 120 university students who showed up in spite of the weather and the homework demands of their classes! We divided the students into five groups and rotated them through stations where they learned about five American holidays and their Christian backgrounds...Christmas, Valentine's Day, Easter, the Fourth of July, and Thanksgiving. It was a tremendous joy to hear one of the students say that it was the first time that she had ever heard the Easter story and another student who prayed to receive Christ after hearing the Christmas story! After learning about the holidays, we had a lot of fun watching the students compete for prizes to see how much they had learned. The final activity was a Photo Booth where the students had great fun with masks and props while taking pictures of each other. The evening concluded with a reunion of Pam and Jim with many of their students from English Camp in Vlore two years ago! While they were enjoying being together, some of us got to hear the testimony of a young man who prayed to receive Christ at the end of the Fall outreach last year. It was exciting to see how much this young man has grown in the Lord in just one year! Older PostRomania: So Much Joy to Share!